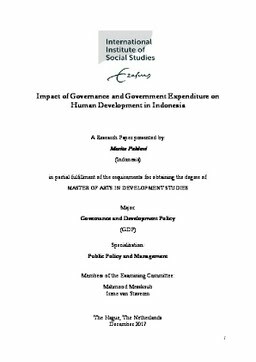 The purpose of this study is to investigate the impact of governance, health expenditure, and education expenditure on human development by using panel data from 33 provinces in Indonesia in 2008 and 2012. Human Development is measured by Human Development Index (HDI), Governance is measured by Indonesia Governance Index, and Health and Education Expenditure are measured as the percentage of Gross Domestic Product (GDP). Regression and Exploratory Data Analysis (EDA) approach are used to examine the relationship. The results of this study show that governance, health expenditure, and education expenditure impact human development significantly. Governance and health expenditure are found to have positive impact on human development; meanwhile health expenditure is discovered to affect human development in negative direction.